The Sanders Model 10e is the culmination of decades of work by designer Roger Sanders towards perfecting hybrid electrostatic design. And a culmination it is, indeed. This is one of the best speakers ever made. Forget that the price of it is modest by contemporary standards for speakers aspiring to be as good as possible. Within its design brief of producing a relatively narrow radiation pattern that emphasizes direct sound, the Sanders 10e’s are as close to perfection as any speaker system I have ever encountered, outside of installations where room and speakers were purpose-built as a unit. For domestic purposes, you can spend a great deal more money, but I do not think that you can buy a better speaker if this type of radiation pattern is your sonic goal. Let me be straightforward immediately: I like speakers that direct sound at the listener, and I always have. Way back in Issue 94, I wrote: “The first principle is this: Only the direct radiation from the speakers contributes to the completely honest stereo image. Sound re­flected off walls, floor, and ceiling cannot and does not provide information about what the absolute sound at the recording session was nor even about what is recorded on the record (or CD). Indirect, reflected, or reverberant sound additions can only create a certain amount of stereo confusion.” I might be slightly less uncompromising today, but essentially I still believe this is right. Various research efforts have shown ways in which sidewall reflections can affect spaciousness without changing timbre and so on. But when the chips are down, I like to hear the direct sound a lot. This is not to say that if you love the sound of omni radiators, say, then I think you are mistaken. This is a matter of personal preference, of what you want out of your audio system. But I think there are really good reasons, which I shall go into later on, for listening to speakers which produce a high percentage of direct sound in their early arrivals and which have minimal sidewall early reflections. If you agree, then I think you will find the Sanders 10e’s (hereafter just the Sanders) speakers to your liking to an extreme—and likely alone at the top. The review that follows is going to be analytical. A speaker that sounds this wonderful tempts one to go all gushy with adjectives—I shall do this a bit near the end. But mostly I am going to describe as well as I can how the Sanders speakers do what they do, my ideas of why they work so well, and what the results are literally. This is a serious speaker design, one of the most serious, and it deserves a serious description, not just some sort of golly gee-whiz write-up or salesmanship package. But be assured that in my view the Sanders are a benchmark of speaker design, a design that is superb in all respects and in some respects raises speaker design to a level never reached before. As conventional drivers have improved, new possibilities of excellence have opened up for box speakers made with cones plus tweeters. Some of these are wonderful and are very satisfying musically, especially if one is willing to listen to them at close range to get rid of room effects. But the Sanders offers things that no speaker can really do unless it has a large enough radiating area to make it directional, as I shall explain. Please just take the “golly gee whiz” for granted, and let us get down to the serious business of what this speaker actually does. The Sanders consist in each channel of a flat electrostatic panel that is mounted above a box woofer which is transmission-line loaded. The speaker has to be bi-amped. The crossover is realized at line level (either analog line level input or digital input) with analog outputs to the amplifiers. The crossover is done via digital signal processing. Analog inputs are converted to digital for the crossover functions. (If you think this conversion to digital is inevitably a problem, then we have to agree to disagree. To my ears, in this case it is not a problem at all, and the result fully justifies the use of DSP here.) The crossover module includes a bass level adjustment and a room correction system, and also allows user-programmable EQ functions. The crossover is very steep (48dB/octave), the crossover frequency being at 170Hz. (In principle, the crossover is user-adjustable, but I would not do that if I were you). The speaker comes in pieces but assembly is very easy and foolproof. You do need an amplifier for the top that can handle the low impedance and capacitive loading of the electrostatic element. I would recommend the Sanders Magtech. One comes with—buy a second one and use one Magtech for bass, one for treble, is what I would suggest. Electrostatics are flat in response by nature as frequency goes up, as opposed to cone drivers which have a rising response before their final roll-off. But as the frequency falls below a certain threshold depending on the dimensions of the speaker, there is an increasing dipole cancellation so that the de facto response falls as frequency goes down. In the Sanders, this effect is compensated by equalization so that the panel is flat to the crossover frequency. One might expect this to limit the dynamic capacity of the panel at the bottom of its operating range. But in actuality, Sanders has developed a panel with truly startling dynamic capability so that even with the EQ included, the speaker is unconstrained in dynamics. In a room of anything like rational size, one will never feel that the speaker is about to run out of steam. It is also indestructible. Even extremely high input signals will not cause arcing. One of the major bugbears of electrostatics has been eliminated! The low crossover and the steep slopes also eliminate the possible effects of the switch from dipole for the panel to omni for the woofer. At such low frequencies, the ear really hears only the level, so if one matches the bass to panel level, coherence is complete. And of course from the crossover point on up, there is only one driver in action. The panel operates as a pure dipole up to the point where the wavelength gets down to the minimum frontal dimension of the panel, which is 13 inches. This is the wavelength of 1kHz, and a little above that frequency the panel will become more directional in the horizontal plane with increasing frequency. (The panel is 40" high so directional behavior vertically happens much lower down. Floor and ceiling interaction is minimal above the bass.) The unity and coherence of using only one driver over the whole frequency range above the bass makes the idea of trying to build a soundfield by combining the output of lots of drivers crossed over in such a way that extremely precise time-alignment is needed to get them to work together seem more than a little misguided. There is a good reason that BBC speakers ran a single driver up to a high crossover point—but no crossover at all is even better. This pattern has several effects. First of all, there is no “baffle step” in the midrange, no frequency where the pattern changes from omni to forward as there is in a box speaker. (Why, you may ask, is this subject almost never discussed in audio reviews? Good question!). 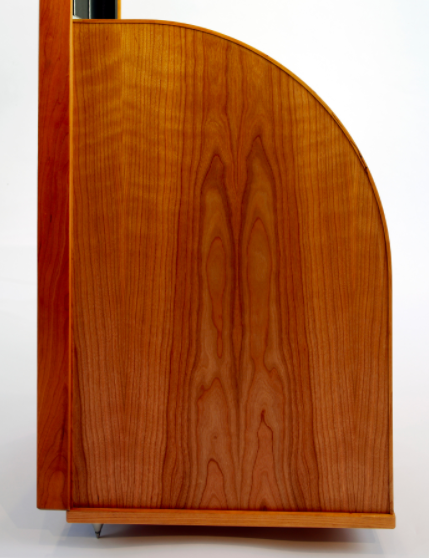 The baffle step introduces a discontinuity in off-axis response, which for narrow-front speakers is right in the midrange, typically around 500–800Hz. The effect is a droop of about 3dB in this range in the response at 60 degrees off axis or so, which is typically what is bouncing off the wall to the listening position. Designers do their best to ameliorate the coloration effect of this. One approach is to use a wide baffle so that the baffle step is below the midrange (c.f., the JBL LSR6332 for example, off-axis responses shown here (jblpro.com/ProductAttachments/JBL.LSR6332.pdf). But with narrow-front floorstanders, the almost ubiquitous type of speaker, this is very likely to be a problem to some extent. With the Sanders, the midrange has no such step at all. This uniformity of pattern, changing only at frequencies above the mids or below them, together with the absence of resonant coloration gives the midrange of the Sanders a lack of coloration that is truly in the top echelon. This is one of the lowest coloration speakers there is. And to repeat, since there is only one driver above 170Hz, the speaker is also completely coherent. There is no crossover like no crossover. And ultra-low in distortion, both literally and in listening terms. Just what were you looking for here that is missing? Nothing that I can think of!